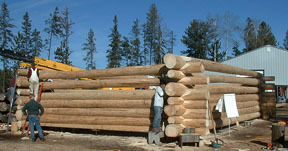 "One Log At A Time" at Natural Log Homes in 2003. 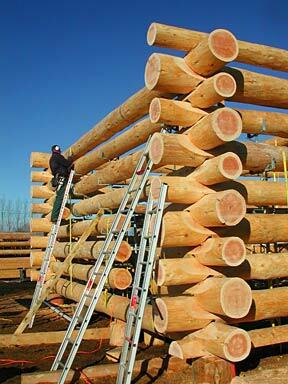 Each log must be fully, finally fitted before a "next log" can be added to any wall. "I recently realized that I had never told how I invented a new method of building full-scribe-fit log home shells. So, here is how it happened. It's sort of a 'tale of two light bulbs.' You'll see what I mean . . . . "
The basic method of building scribe-fit log walls has remained unchanged for centuries. The process has always been: a log is placed on top of the handcrafted wall, and then is lowered down to touch the logs below by rough-notching and then by final-scribing and cutting. One after another, each new log is added and the walls slowly grow taller one log at a time. This is the ancient "one-log-at-a-time" method of log construction. 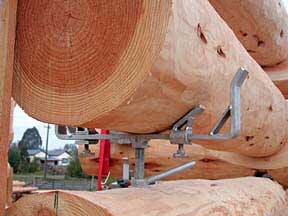 One-log-at-a-time construction methods are detailed in my book, the Log Construction Manual. The workshop shell that my class was building when my first light bulb went "on." On March 3rd, 1999, an idea came to me: I could rough notch an entire building, stack it up with gaps, and then final scribe the entire building and all its logs at one time. It was after a long day teaching a workshop, and when work was over I was just sitting around and having a beer with Graeme Mould, and two of my students, John Wilson and Olaf Edgar. Then a "light-bulb" went on over my head. They saw the look on my face and knew something big had just happened to me, and I described to them the vision I had just had. It really did feel like the "light-bulb" you see in cartoons : I actually saw an entire log shell stacked up and ready to scribe. I had never thought of doing this before, and I had never seen it being done or attempted. The idea had never occurred to me before then. Then . . . .wham, there it was. I actually saw it as clear as could be. I didn't see one log being added after another—no, I saw the whole shell stacked up with gaps, and I knew it could be scribed. My second feeling: I had a sinking feeling in my stomach . . . I knew this was big. I had only the beginning of an idea of how to do it at that time, but I knew it could be done, and that I would be doing it . That "vision" I had (there is no other word for it) had given me a feeling and a confidence — I had no doubts at all, and I knew it would be good. Later that spring, at a general meeting of the Great Lakes LogCrafters Association, I stood up and said that I was working on a project that would speed up log building, and that if the Association put together some professional builders and got some logs I would show everyone what I was talking about. I had not yet built an accelerated shell, but I was so sure I could do it, and that it would be fast, that I presented the GLLCA with the challenge: get me logs and some builders and we'd build a shell in 4 days. Jerry Wait of Frontier Builders, who was at that meeting, organized the logs, offered the venue, and the Association got the volunteers for a hands-on first-ever Accelerated log shell for the upcoming 1999 Halloween weekend in Land O' Lakes, Wisconsin. The Association paid me a fee to lead the workshop, and when they sold the log shell it made a nice profit for the Great Lakes Association. You Can Patent a Method? In mid-October, a bit more than 2 weeks before the upcoming workshop, I met with 2 lawyers at Fredrikson & Byron, a large law firm in Minneapolis, to see if they thought that my accelerated log building idea could be patented. Frankly, I doubted that it could. All the patents I had ever heard of were for "things" — you know what I mean, gadgets, like variable speed windshield wipers, or masking tape (my uncle invented scotch tape). I thought that methods or processes could not be patented. I didn't know that much about patents. A good friend told me to at least find out for sure from an intellectual property lawyer, and he arranged that first visit and came with me to the meeting. (And he later became my business partner in Natural Log Homes.) The lawyers heard me describe my idea, and I told them I was going to test it on Halloween weekend. Their opinion: yes, if it works, the method could be patented. And they told me to keep a good record of what we did that weekend in photos and words. The start of the Accelerated project at Frontier Builders. It was the perfect place to do this—thanks to Jerry Wait and Frontier Builders! Over the 3-day Halloween weekend, about 16 different people came to help or watch—log builders, log home owners, curious folks. 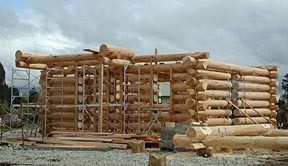 Frontier Builders had all the logs peeled ahead of time, and I had asked Jerry to get big, straight ones—logs we could use in one piece that would span from corner to corner in the 4-wall shell. On Day One (Friday, October 29th, 1999) I introduced what we were going to do to everyone: stack up logs on their rough notches, and then scribe several layers at one time. Stacking went easily, and pretty fast. Not everyone there picked up tools. One log builder had come to watch— he said it was impossible and going to fail. Near the end of the first day, Duane Sellman and Scott Shelton told me they thought I was mistaken. The three of us huddled in one corner discussing what was going to happen. The rest of the group pretty much kept their distance, as I remember . . . I think they could tell there was a problem. The exact details of how to scribe more than a few logs at a time was a problem. We had done a few logs, but what about a whole building? Was it going to work? How? Conversation at dinner that night at the hotel was not about Accelerated methods— I think maybe some could see that I was worried about how I was going to make it work tomorrow. After all, we had a bunch of logs stacked up. In the morning we needed to scribe them. The morning of October 30th, 1999. The first time an Accelerated stacked shell was ever scribed! Lying in bed that night, I was worried that I might have made a very expensive mistake. I respect Jerry Wait and my fellow handcrafters in the Great Lakes Association, and didn't want to let them down. I felt strongly that Accelerated would work, but I did not know exactly how to make it work—how we could scribe those logs that were rough-notched and stacked and waiting for us. But that changed overnight. The answer came to me in a dream that night. The minute that I woke up Saturday morning I knew how to do it—and the solution was surprising, even shocking (to an old-time OLAT log builder like me!). 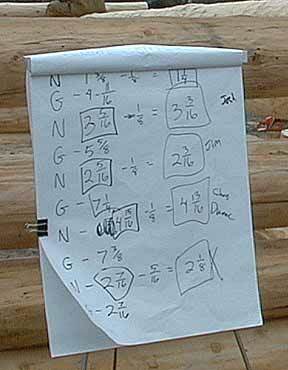 The answer went against the basic methods that I knew about scribing and fitting logs. This was the second "light-bulb" that had gone on for me for Accelerated log building. The first had been in March: the idea to stack a whole shell. And now, the "key" really, to Accelerated scribing. Thank God for those light bulbs! Saturday morning I told Jerry Wait and a few others that the answers came to me in a dream the night before . . . "Yes, I know it sounds a little strange that I dreamed the solution!" It didn't seem to surprise them, though, which is interesting. It required a lot of math, and a mental twist of sorts– because the solution is counter-intuitive. Here is a photo I took on Saturday morning of the instructions that I wrote on how we were going to scribe the logs that we had stacked the day before. On Saturday morning, we scribed the logs that had been rough-notched, took them off the stacked shell, and 12 people cut them in one and a half hours, and we got them back on the building— the fits were good. The group then rough-notched 8 more logs (4 layers) and got them stacked onto the shell before we called it quits at dark. I was sure a bit more relaxed at dinner Saturday night than I was on Friday night! Calculating the scribe settings, a detail enlargement from the photo above showing my math on Saturday morning, October 30th, 1999. Duane and Scott had told me that I was wrong in some of my thinking the day before—as if I needed to be told that! I could see it was not going well, and not as I had thought it would go. I had a wrong concept, and I knew it. But without the math solution (from my dream!) the logs that we had stacked on Friday could not have been successfully scribed on Saturday. Scribing logs in layers with equal gaps is easy, but scribing logs in layers with unequal gaps was really difficult. And I had seriously unequal gaps in this shell. As a side note, Scott Shelton, some time after this weekend, did some thinking about underscribing that he calls his "jack and ride" theory. Accelerated methods do tend to make a builder look at what he's been doing One-Log-At-a-Time (I call it "OLAT") in a new light – and Scott was spurred by what my Accelerated method meant for underscribing (overscribing) as it is practiced OLAT. I think that Scott is right that underscribing as it is practiced in one-log-at-a-time construction is not completely correct. Scott's ideas about jack-and-ride were developed by him after the Halloween Accelerated project, and they continue to develop. I also have had new insights into traditional, one-log-at-a-time methods as a result of using Accelerated methods. Sometimes I tell log builders that Accelerated methods are the way log walls are "supposed" to be built, by which I mean that some of the puzzling things that we have to do with one-log-at-a-time shells in order to get them fit and stay fit over time can be easily explained by understanding Accelerated methods. Like, "why is the reasonable underscribe for sill logs less than the underscribe of logs immediately above them?" "What does the loss-to-scribe actually look like? "Accelerated thinking makes the answer to these questions, and others, easy. There's nothing so refreshing as seeing something very, very old (the one-log-at a-time method) revealed in a new light. "Oh! . . . . so that's why that happens!" to be used in Layer 6. (Layer "X") of every Accelerated shell. The first formula is for finding the scriber setting for Layer 6 of a building. (The formula for Layer 9, or Layer 15, or Layer 2 is a little different than this one.) This formula works great, but it only works for the logs of one layer. There's nothing wrong with that, it's just that you need a formula for every layer, which means that you need a lot of formulas for even a short stack of logs like we had. This first formula is the one that came to me as a result of my dream, and this is an example of one of the many formulas that I used on Saturday morning to figure out what scribe settings were needed for each layer of our stacked shell with unequal gaps. I like the second formula even better because in those few letters and symbols it has all the scribe settings for all the logs in every Accelerated shell that has been, or ever will be, built. The second formula is universal, and I really like that about it. I came up with the second formula later — I didn't use it during the Halloween weekend workshop. It says the exact same thing as the first formulas, it just needs less space to do it—this one formula does it all. In the second formula, "x" means "any layer in the building, please choose one of the layers and fill that layer number in for 'x'." (In algebra "x" does not mean "multiply times," like it does in arithmetic.) So, if you want to know the notch setting for Layer 8, for example, then you multiply the numbers inside the parentheses by minus one raised to the power of 7 (because x - 1 is equal to 8 minus 1 and this equals 7) and then you do the arithmetic. The second formula took me a little while to figure out (I hadn't done an "infinite series" equation since I was at the U of M back in the 70's), and I am kind of proud of it. "Before" picture: one stacked corner in the world's first successful accelerated shell. "After" – the same corner after cutting. To get your bearings and compare it to the "before" picture, note the checked log in the upper left of each picture. On Sunday, I made our chart for scribing the 4 layers (8 logs) that we had stacked on Saturday, but this time I did it graphically – I used the scriber settings themselves to show everyone what I was doing. The end result was the same as the mathematical method I had introduced on Saturday morning, but I thought that not everyone had understood the math, so I used this more "hands-on," or visual approach, to the scribe settings for each layer of the stack. The graphical, hands-on method, was not as technically accurate for figuring scriber settings as the math method I used on the first day of scribing, and I actually haven't used it since for building. But I still do use this as a teaching tool . . . . especially for people who don't like equations and math. But you really can't accurately scribe a shell like the Halloween stack without the math and equations I came up with. This is how far we got on the Halloween weekend project in just over 2 days. We finished our work on the Accelerated shell around noon on Sunday, October 31st. A total of 28 logs had been scribed, 18 of them cut and fitted, and 10 logs were scribed, but not yet cut. A few Great Lakes Association members went on to finish the shell (thanks to Rick Baron, and others) and the Association sold it to raise funds for their future projects. The world's first Accelerated building is now being happily lived-in not far from Land O' Lakes, Wisconsin, where it was born. Natural Log Homes stacked shell. In order to get a patent, an invention 1) has to be new, and 2) it has to work. The government patent offices first had to do a lot of research so that they were sure that my invention was new (as compared to the "prior art" as they call it). Even if something is a fantastic idea, it cannot be patented—until you can figure out how to make it work. "Some day" is not good enough. The inventor must have actually figured out how to make the invention work. You cannot patent something that you don't know how to do. This is necessary because the patent offices have to make sure they don't issue patents for things that don't work. So, my Accelerated Log Building Methods definitely worked— we had stacked a shell and I had figured out the math behind the scribe settings, and the logs all fit when we put them back together. It passed one of the two tests: it worked. What about the second test: were Accelerated Methods new? As you're about to see, the answer is "yes, Accelerated Log Building is new." And here's what that means . . . . The front cover of my first US patent for Accelerated Log Construction. What is "New"? - - Patent Offices Look for "Prior Art"
I made applications for patents in the USA and Canada. Each government hires researchers that do nothing but look for "prior art" — which is evidence that an invention was done earlier, or by someone else. "Art" here means sort of the same thing as "artifact"—prior "art" has nothing to do with painting or sculpture. Sometimes years go into the patent-search process for prior art. First, my lawyers hired a professional patent searcher in Washington, DC — he found no problematic prior art. Both the US and Canadian patent offices also examined all the evidence and their files, and other public records in both of countries, and they found that my invention was new. I am telling this part of the story because long after Land O' Lakes, and before my first patent was issued, a builder sent me photos of something that he said was "prior art." His photos actually show that his method had failed, whatever his method was. But if you do not know how to Accelerate, then you cannot pick out the failure in his photos. But if you know and understand Accelerated methods, then his failure is obvious — because you know what to look for. An update: in June 2003, this builder basically admitted that he did not know how to use Accelerated methods. From time to time, however, he still is making claims that he did it first. The first successful Accelerated Log Building project was my 1999 "Halloween Project" in Wisconsin. And I had never heard of any attempt or idea by anyone else before I succeeded at Accelerating the Halloween project. So, my Accelerated methods were new and they worked, they met both of the "tests," and a patent was issued for my invention. 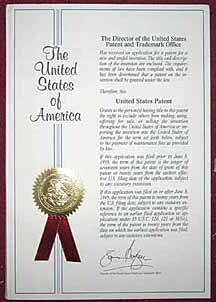 The Patents that have issued so far: US Patent No. 1 is 6,412,241 (July 2, 2002), US Patent No. 2 is 6,564,526 (May 20, 2003), and Canada 2,299,841 (Oct. 28, 2004). Others applications are still pending in the USA. 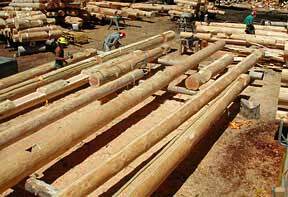 Other log home companies (in the US, Canada, and overseas– there are about 14 companies that use Accelerated methods) have "sub-licenses" that they negotiated with Natural Log Homes (or, before NLH and Accelerated Log Building,Inc. were formed, with me personally). In general, those companies do not advertise that they use Accelerated Methods (though a few of them do mention it in their ads or web pages). This is their choice, and we do not give out the names of any companies that hold sub-licenses. This NLH Accelerated stacked shell is ready to scribe. We use Accelerated Methods for most of Natural Log Home's projects. The biggest home shell that we have accelerated had 14 notched corners, it also had a lot of log floor joists and log summer beams going both directions, and it was tall and had a LOT of openings – as you can see in this photo. That's Graeme Mould, Natural Log Home's Operations Manager, kneeling on the bottom left of the photo. 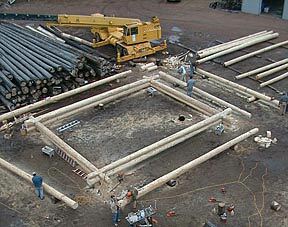 For projects that are larger than 14 corners, or are taller than 11 rounds, we tend to build one-log-at-a-time for now, because we currently have a limited number of log holding devices and scaffolding. When we get indoors and have enough gear we'll be Accelerating all our projects. There is no limit to the size or design of the home that can be Accelerated. We have built simple rectangles and boxes, T-shapes, crosses, and L's. We have scribed in valleys, tie beams for trusses, summer beams, floor joists, and more. Other companies have built Accelerated shells larger than 14 corners. Most of Natural Log Home's customers bring us plans for medium-size homes of 4 to 14 corners, 9-foot to 11-foot log walls, and less than 4000 square feet. That's the market we are in. 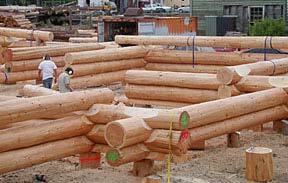 More than 100 log shell projects have been Accelerated as of May 2006. An Accelerated shell, once it is stacked onto its foundation, is identical to the shell that would have been built one-log-at-a-time. A "goal post" holds a one-notch log in the stack. I have kept improving and fine-tuning Accelerated methods. Yes, other "light bulbs" have gone on—some are low wattage ones, and some have been really, really big! Some of the little ones include the gear we use (log ladders, little "tommy" jacks, hinged packers, and so on) to hold logs in the stack. We don't cut rough notches twice. I have also improved the way doors and windows are laid out and cut, when and how floor joists and beams are put in, and how roof parts, including valleys, are scribed into a stacked shell. The scribed fits are the same quality as one-log-at-a-time log fits. 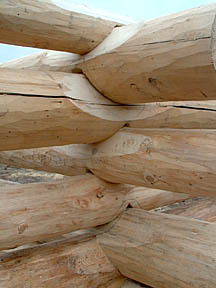 This close-up photo is from a 2004 Natural Log Homes Accelerated project. Log Builder's Concerns . . . " but what if " . . . I have heard that some log builders worry about things that could go wrong when using Accelerated methods. Actually, we have never had any of them happen to us. We have never had a log mis-scribed enough to be noticeable by us, much less by homeowners. At Natural Log Homes we do not put a log on and off the building to make small corrections and fix problems and hang-ups. That just is not how we build. We scribe a log correctly once, then we cut it, and I expect it to fit first time, every time. We do it that way every day, and that's the way I have built for 22 years. We have never "lost" a scribe line off a log before it could be cut out (we are careful to use an ink that really lasts). We have never made a math error in scribe settings. We have never had a log mis-cut that required anything more than a small patch job: one log that was supposed to get a shallow-cove groove instead got a Deep V at an arch opening. It looked bad. We knew about it before it was sent to the customer. The customer decided to patch it himself. This accident could have happened One-Log-At-A-Time (OLAT), of course, so it was not an Accelerated problem, but I wanted to mention it anyway. We have never lost a log in shipment. We cut arched openings and flyway curls (both of these are curved cuts through several layers of logs) in the stacked shell. No problem. We have never had a log's label rub off (meaning it would be a puzzle to find out where it goes— but, actually it would be easy to figure that out!) And again, this risk is not limited to Accelerated buildings since this is also a potential problem with OLAT. We use plenty of logs that are shorter than the wall. In fact, the only Accelerated shell that I have ever built that used all full-wall-length logs was the very first one. Since then every Accelerated stack I have built has had door and window openings in it as we stacked. You can see them in the pictures on this page. Of all the companies that have sub-licensed the Accelerated method, I have had only one report of an Accelerated problem – one man on one corner of one stacked shell used a scriber that he had set with bubbles slightly off left-to-right. The corner that he scribed had a slight rotation when it was assembled. The company reported that they pushed on the corner when they got to header log level to get the fits into place. This is a problem we have never had at Natural Log Homes because we assign a man to scribe several layers in a shell (for example Layers 3, 4, 5, and 6) and then he scribes those layers in all the corners - - he does not work in just one corner and scribe all the notches. 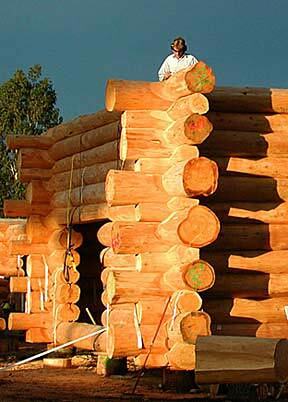 Accelerated results: another sweet building, "Homebush," Natural Log Homes 2004. A nice cabin we call "Four Peaks." All stacked and ready to be scribed. 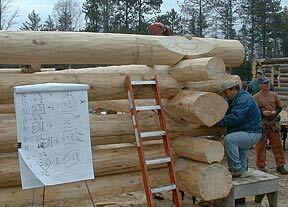 At Natural Log Homes we are building about 30% faster than we used to. This is true when I measure either the number of lineal feet fitted per man hour worked, or when I compare one-log-at-a-time (OLAT) to Accelerated when we built the same structure twice. Some houses are closer to 35% faster. Some have had time savings of only 15% (but that one was our largest Accelerated project ever, and 15% equaled 600 man-hours that we saved on that job -- and so 15% was a really big savings!). Some of the companies that are sub-licensed report time savings, and others tell me that they use Accelerated Methods because they are safer, and they would use Accelerated Methods even if it were slower than one-log-at-a-time ! If you use the double-cut long groove, or if you cut the top-of-log kerfs to control checking as you build OLAT, then Accelerated is definitely safer: because with Accelerated methods, all the cutting is done with your feet on the ground, not walking backwards on logs on top of the wall to cut a Deep-V or a kerf. Your first Accelerated project or two might be the same speed as OLAT. But it's like anything—the more you do it, the better you get. There is a learning curve. (Think back . . . back to when you first learned OLAT. Was your first shell as fast as your tenth shell?) As a builder uses Accelerated methods, he gets better at them, and then his time savings increase. At first it may be about equal to OLAT, and then it gets faster. That only makes sense. 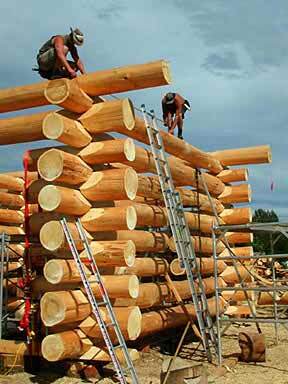 At Natural Log Homes we are still speeding up, and we aren't even close to as fast as we will be. I expect time savings of 50% to 60% over OLAT methods, and even more is entirely possible. I'll keep you updated from this web site! I've got big things planned. 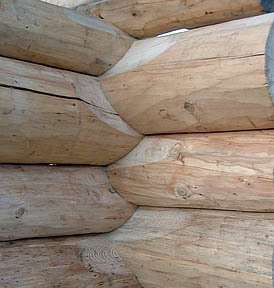 Reassembled log shell, Natural Log Homes, 2003. "What Will the Employees Think?" 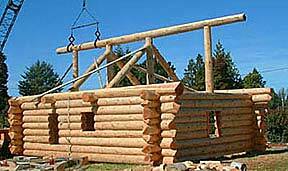 The staff at Natural Log Homes like Accelerated construction as much as, and several like it much more than, one-log-at-a-time log construction. So this has not been a problem for us. We use Accelerated because it is faster and safer than OLAT. It is safer because we can do all our chainsaw work with the men having their feet on the ground. The staff say they like it on the days they are scribing and no chainsaws are running on their building. And they also like getting into the cutting and staying with it until it is finished, which isn't all that long! They like that they don't need ALL their tools every day. They like how fast it makes the work go, and the day go. A lot of log builders are in their 40's and 50's, and they have been log building for decades the exact same way. They have job satisfaction, and that counts for a lot. Why should they change? Accelerated may not be very attractive to them. But the issues are different for business owners: many report very high turnover in their staffing. Because it takes years to build a log builder they are in a constant struggle to train staff fast enough to keep up with the talent that is leaving them. Accelerated methods help solve staffing problems. In a medium-size log building company (say, 6 to 12 staff) you do not need to train everyone to do everything. And this is a BIG help. Some men can be used just to stack shells, some just to cut notches and grooves. In larger yards, some men only need to be trained to scribe—they'll be busy doing that 40 hours a week. There are more people who can be taught to scribe in a week, than can be taught to be log builders in a week. Job specialization in an Accelerated yard is easy, and specialization brings lower costs and easier training. Acceleration actually organizes the entire work flow more efficiently. It just feels right! With OLAT a builder uses every one of his tools (and that is a lot of tools) every 3 or 4 hours. With Accelerated, a builder uses only a few of his tools each day. Business owners pretty quickly see the benefits! If you're going to lose staff anyway (some staff turnover is inevitable), isn't it better to lose less-experienced staff and concentrate on keeping the most experienced staff? The answer is "yes." An Accelerated shell by a licensed company. 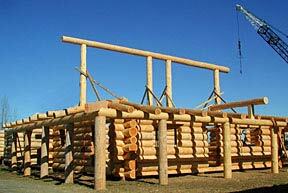 Accelerated Log Building (ALB) Methods can be used or tried only by getting a sub-license from Natural Log Homes. No, patent laws do not allow someone to try one shell for free. And they don't let someone try to "re-invent" Accelerated methods on their own, and then claim independence from the patents. That is a misconception and is not true. Other log home companies (in the US, Canada, and overseas– there are about 14 companies that use accelerated methods) have "sub-licenses" that they negotiated with Natural Log Homes (or, before NLH was formed, with me personally). In general, those companies do not advertise that they use Accelerated Methods (though a few of them do use it in their ads or web pages). This is their choice, and we do not give out the names of any companies that hold sub-licenses. A company that invests in Accelerated Methods expects rewards, and that is what we want them to get. If there is a un-licensed builder or business that is competing against a licensed business, then we'll go after them. That's only fair. We are serious about helping companies speed up their production, make their work safer (feet on the ground), and make it easier and faster to train their staff. These are 3 huge advantages for a business. Accelerated Methods are not recommended for do-it-yourselfers. One-log-at-a-time works better for them. Accelerated methods are not really suited for do-it-yourself, owner-builder projects. Here are some reasons why I say this. 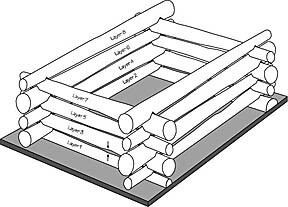 The one-log-at-a-time method works very well for an amateur who wants to build their own from start to finish -- buy logs, peel them, and build their cabin. Logs on racks, and being cut. This is how you could do your Cut-It-Yourself log home kit. 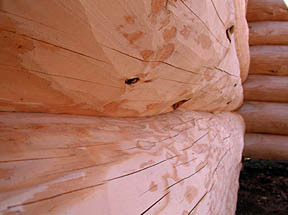 Our average log home shell takes NLH staff about 200 man-hours to cut all the notches and grooves. Natural Log Homes is offering a very few people the opportunity to try a new handcrafted log home kit: logs that have been drawknife-peeled and scribed, and are ready for you to cut the notches and grooves. The only way to produce this kit is with Accelerated Methods. 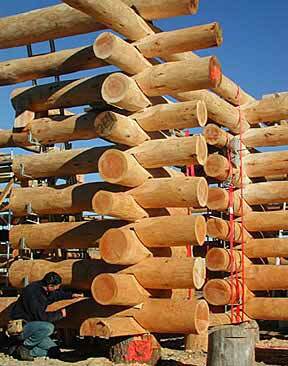 Here's how we do it: we stack all the logs for the shell for your home, and then we scribe all the grooves, notches, and flyways. We number all the logs, and take the stack apart. 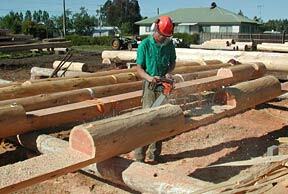 Normally this is when Natural Log Homes staff cut to the scribe lines, and prepare to ship the ready-to-assemble log home kit to the homeowner. With Cut-It-Yourself (CIY), we will ship the scribed logs to the customer as a ready-to-cut kit, with all the logs you'll need, all the logs in your home marked and ready, and then you cut all the notches and grooves. You build your own handcrafted, full-scribe-fitted log home, except much faster, with less training required by you, and you need far fewer tools. Scribing -- our experts scribe all notches, grooves, and flyways to the highest professional standards. Seriously interested Cut-It-Yourself customers should apply to PO Box 283 (River Falls, Wisconsin 54022). Or by e-mailing me (link is below). Very few CIY kits are available, and prospective customers will be interviewed to help ensure they have the required time, budget, and skills to successfully complete a Cut-It-Yourself log house project. This page was posted in May 2006.